After 24 h the grid is removed. 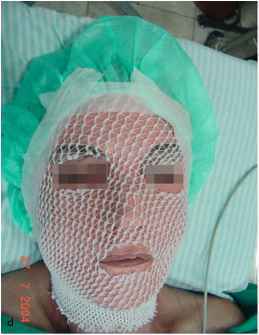 Following removal of the grid, the mask comes off the face almost with no effort, since the skin exudate lifts the tape. Analgesia is not required, since the procedure is almost painless. Occasionally some physicians remove the mask at 48 h, but we find it unnecessary and more troublesome for the patients, since while the tape mask is on, the eyelids are frequently swollen shut. We feel that this inconvenient period must be minimized. After the tape mask removal the exudate is cleaned by sterile saline. Spot peeling and re-taping may be done if the skin looks under-peeled, particularly in areas with severe wrinkling. It is usually accompanied by a short-duration burning sensation. The tape is left for an additional 4-6 h and then removed by the patient. 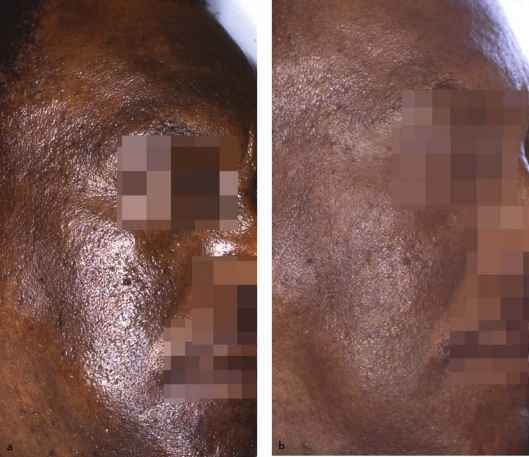 We cover the face with bismuth subgalate antiseptic powder for 7 days (Fig. 8.10). Other options include occlusive moisturizers, antibiotic ointments, and biosynthetic occlusive dressings such as Meshed Omiderm. At this stage we recommend using regular pain killers every 4 h for the first 2 days. Some physicians administer systemic corticoids to reduce the swelling and inflammation after the peel. Neck swelling is expected after deep peel. It disappears within 4-6 days. Bismuth subgalate powder acts as a regenerative mask and absorbs skin exudate and gradually creates a firm and rigid mask. It may crack in some areas, usually around the mouth and eyes. Some patients experience itching and can be helped by oral antihistamines. On the eighth day wet soaking with tap water while standing in the shower is used to soften the powder mask. Repeated applications of Vaseline enhance the detachment of the "second mask" from a newly formed skin (Fig. 8.11). After the procedure, the patient is advised to use water-based creams and potent sunscreens. 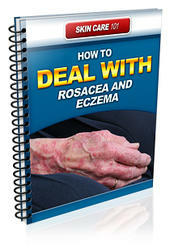 The erythema is extremely intense in the first 2 weeks, and gradually resolves over a period of about 2 months. During this time, the use of makeup with a green foundation is encouraged to assist the patient in resuming daily activities.